LAST CHANCE: Win a Linn Majik LP12 system worth £4915! | What Hi-Fi? LAST CHANCE: Win a Linn Majik LP12 system worth £4915! To celebrate the 35th anniversary of What Hi-Fi? Sound and Vision and the legendary Linn LP12 turntable (above), we've teamed up with the famous Scottish hi-fi company to bring you this superb prize. One lucky reader will get to win this stunning system from hi-fi experts Linn: a classic Linn Majik LP12 turntable (£2350), Majik-1 pre and power amp (£1630), and a pair of Majik 109 speakers (£935). In addition, everyone can enjoy one Studio Master music download, courtesy of Linn. To get your free track, simply choose from one of the ten titles listed below and go to www.linn.co.uk/whathifi and enter the promo code whathifi. The free tracks will be available for download until December 31st 2011. 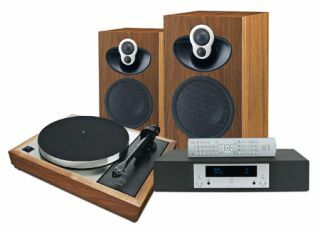 To enter the competition to win a Linn LP12 system, click here. Please note: you must be logged in to enter.